Pulsars are rotating neutron stars that are left behind when massive stars explode. They are continually spinning down due to electromagnetic dipole torques, losing most of their energy to magnetized particle winds. A smaller part of their energy loss appears as radiation across the electromagnetic spectrum, with most of the power concentrated in the gamma-ray band. Animation of an pulsar: clouds of charged particles move along the field lines and their gamma-rays are beamed like a lighthouse beacon by the magnetic fields. As our line of sight moves into the beam, we see the pulsations once every rotation of the neutron star (Credit: NASA/ Goddard Space Flight Center Conceptual Image Lab). First discovered at radio wavelengths in 1967, there are presently about 2000 pulsars known. The vast majority are seen only in radio, but the numbers detected at optical, X-ray and gamma-ray wavelengths are growing. 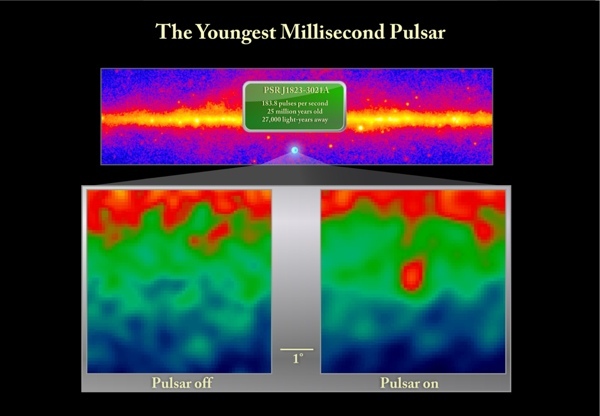 The pulsar population divides into two categories: canonical pulsars, with rotation periods between tens of milliseconds and seconds and surface magnetic fields around a trillion Gauss, although those with millisecond periods have much lower surface fields. The millisecond pulsars (MSPs) are thought to be recycled from the canonical pulsar population through spin-up by accretion from a binary companion. Pulsar periods and period derivatives can be used to estimate physical parameters such as characteristic age, magnetic field, and rate of energy loss. All gamma-ray pulsars have high values of the rate of energy loss. Their characteristic ages tend to be either rather young (less than a million years) or very old (greater than a billion years). 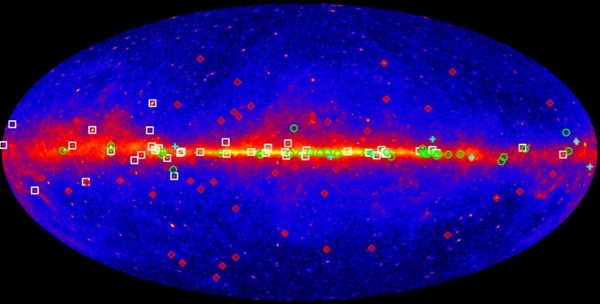 One of the most exciting discoveries by Fermi-LAT has been revealing the expansive class of millisecond pulsars (MSPs) that emit MeV and GeV gamma rays. At least 17% of known MSPs are now detected as gamma-ray pulsars, compared with only 3% in the canonical pulsar population. Gamma-ray pulsations from these old, recycled pulsars are found by folding LAT data at periods of known radio MSPs. In addition, many new MSPs (35 to date) have been discovered through radio searches of LAT unidentified sources. The radio timing solutions then reveal the gamma-ray pulsations. 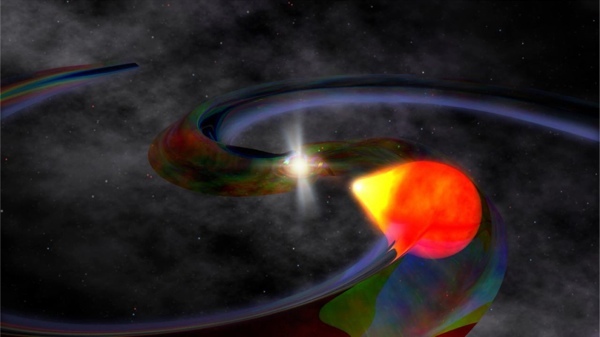 Among the newly found MSPs are a number of "Black Widow" systems where the pulsar wind is ablating its companion star. MSPs are very stable clocks, and so are highly sought-after by groups that use pulsar timing arrays to search for ongoing background gravitational wave signals coming from merging black holes (e.g. NANOGrav). But MSPs are difficult to find at radio wavelengths, given their short periods and large fraction in binaries. 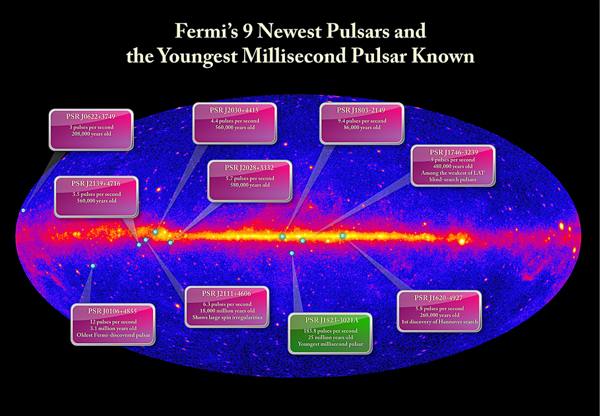 By using the sky positions of Fermi sources, pulsar searchers have greatly enhanced their discovery rate for new MSPs. 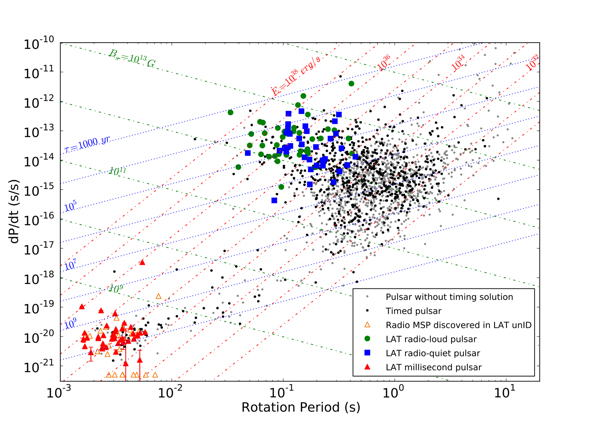 In addition, the LAT sees MSPs in globular clusters, both collectively and individually. Gamma-ray emission has been detected from at least eight globular clusters, including a surprisingly young MSP in cluster NGC 6624. Finally, gamma-ray pulsations have been detected from a pulsar in the Large Magellanic Cloud, extending the reach of gamma-ray pulsar studies to another galaxy! 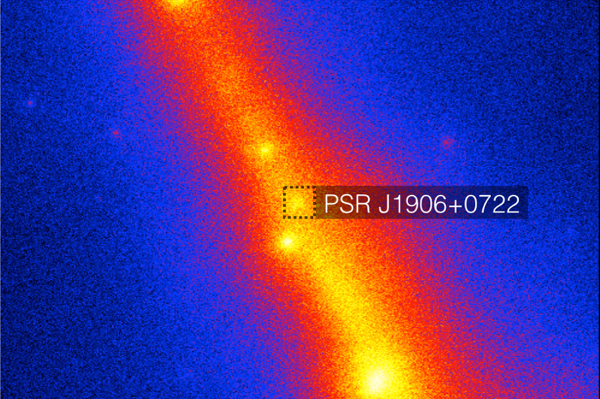 Finding the signature of a pulsar within Fermi-LAT data is often highly complicated and processor intensive. 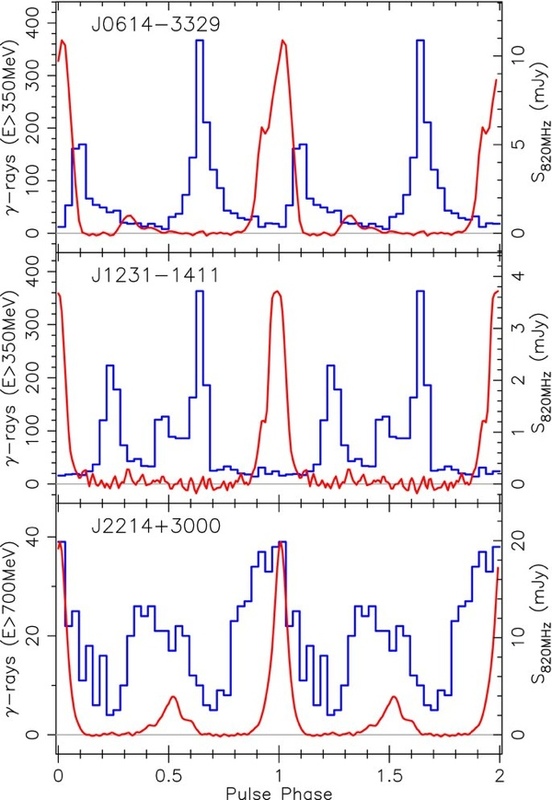 Without a prior period to search on (given by radio or X-ray measurement), blind period searching within LAT data for a pulsar period of unknown time characteristic can quickly become an intractable problem. Scientists have now begun to harness the power of "crowd computing" (most commonly used for the Einstein or SETI at home searches) which utilizes the power of thousands of invidual personal computers (during their users off time) to search for pulsar signatures.